Wello’s mission is to effectively deliver clean water to a thirsty world. By reframing the water crisis as an opportunity, the Wello team has developed an innovative business model that empowers individuals to use the Wello WaterWheel—an innovative water transportation tool—as an income-generating tool to lift their families out of poverty. Just weeks away from WaterWheel 2.0’s launch, WJF’s Erin Jones checked in with founder Cynthia Koenig about Wello and their progress. Our team is based in India: Bombay + Jodhpur, Rajasthan. For many of us clean water comes with the twist of a faucet. But for 1 in 6 people, access to water requires hard work: hours of walking, waiting in line and heavy lifting. The time spent fulfilling this basic need keeps many children out of school and prevents women from carrying out all the domestic and income generating work for which they are responsible. In much of the developing world, it is often necessary to walk five miles (8km) or more every day to fetch water. In the dry season, it is not uncommon to walk twice this distance. Collecting water can be dangerous too. The traditional method of carrying water – carrying a 5 gallon (20 liter) water bucket on the head – can severely damage the spine, causing severe pain and even leading to complications during childbirth. Over the past decade, I’ve lived and worked throughout Central America, Southern Africa, South and Southeast Asia – my work was focused primarily in rural communities with limited infrastructure. As a result, I became intimately familiar with the challenges associated with the lack of access to clean water. I’ve spent countless hours collecting and purifying water, and I know what its like to not know where your next drop of water will come from – or when. Research shows that when women have extra time, they choose to spend it on activities that boost family income, education, health, and wellbeing. Women with even a few years of basic education have smaller, healthier families, are more likely to work their way out of poverty, and send their children to school more frequently. Female education is accepted as a key means of breaking the cycle of poverty. Isn’t it about time we changed the status quo? The WaterWheel is a 50L container that hygienically transports and stores water. The WaterWheel moves two to three times the amount of water possible using traditional methods, in much less time and with much less effort. By removing the burden of water collection from the shoulders of women and girls, Wello makes it possible for them to pursue other (more productive) activities in their free time. We also make other players along the clean water value chain more effective; from organizations working on educating families about the benefits of clean water, to community level clean water kiosks; everyone benefits from the WaterWheel. Has WJF competition and mentoring program helped you on your way? The feedback I received from the William James Foundation was far and away the most comprehensive, detailed, and useful feedback I’ve received. In fact, over 2 years later, I still refer to my feedback forms! I’m still in touch with a few of Wello’s judges, who continue to provide valuable advice, feedback, and support. The Unreasonable Institute, Opportunity Collaboration, The Lean Startup by Eric Ries, and iOnPoverty. 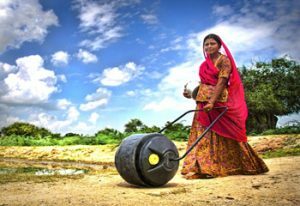 After eight months of research, hundreds of hours designing and prototyping in the field, and conversations with over 1500 community members, practitioners and experts – the WaterWheel 2.0 design is complete, and will be available soon!